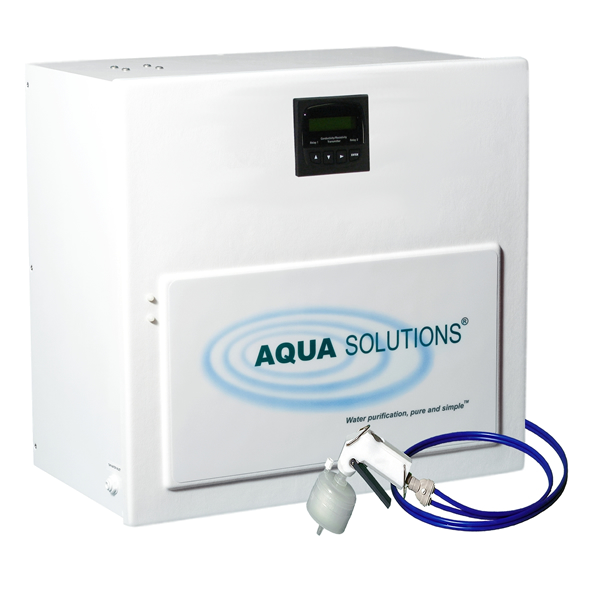 The AQUA SOLUTIONS' Model 2122B is also available in a High Flow/Capacity (4-10 Liters/Min) version. These laboratory water purification systems are semi-custom designed for each application. Contact your salesperson for more information. This unit operates on ordinary tapwater. For pretreated water operations, see Model: 2121B or Model: 2121BU. The Model: 2121BU and Model: 2122BU versions of this system are equipped with a built-in ultraviolet (UV) sterilizer. The system also has versions available with built-in reverse osmosis pretreatment in a single cabinet design measuring just 20" wide x 20" high x 12" deep (Model: RODI-C-12B and Model: RODI-C-11BU). Designed for applications that require up to 20 Liters/day of Biological Grade Type I Ultra Pure water. 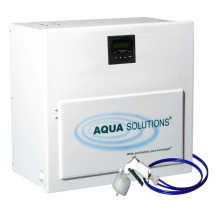 The system produces 2-Liters/minute of 18.2 megohm-cm Type I water from ordinary tap water that contains less than 250 PPM of total dissolved solids. The unit includes a built-in ultrafilter to reduce pyrogen, endotoxin, DNase and RNase to the lowest possible levels. All AQUA SOLUTIONS Biological Grade Type I DI Laboratory Water Purification Systems produce purified water that meets or exceeds ASTM, CAP and CLSI specifications for Type I reagent grade water. Since ordinary tap water contains 5-25 times the impurities of pretreated water, these tap water systems have lower overall capacity than the pretreated water systems.